South America is also a subregion of the South American Continent. 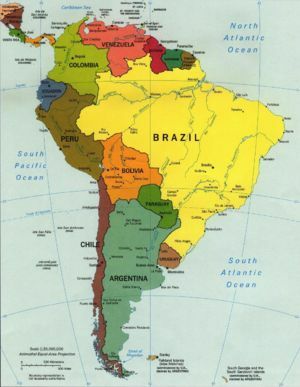 South America is a continent in the Southern Hemisphere, and part of the Western Hemisphere. To the west it borders the Pacific Ocean, to the east it borders the Atlantic Ocean, and the Caribbean Sea and North America are northwest of it. Together with North America it forms the Americas, and it was named after Amerigo Vespucci. It is the fourth largest continent by area at 17,840,000 km2 (6,890,000 sq miles), and covers almost 3.5% of the earth's surface. Its population in 2005 was 371 million, the fifth largest of the continents. This page was last modified on 13 July 2016, at 14:31. This page has been accessed 23,730 times.